Lemoncherry Designs – Page 2 – Give your home a gift! 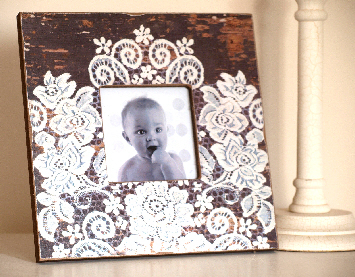 Wooden Photo Frame Rustic Effect with White Lace Pattern Decoration 19cm x 19cm Lovely individual decorative photo frame with printed white lace design. Perfect for that extra special photograph of a loved one. Make such a lovely gift. Pretty Lace Effect Floral Pattern. Wood Frame with Stand. Decorative Rose Flowers with White Lace Printed Effect Swirls. For more info’ please follow this eBay link. Thank you. 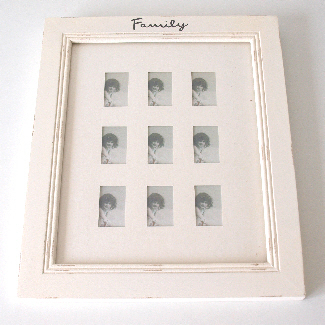 Wooden photo frame with 9 thumbnail small multi image apertures Stylish Individual Chic & Shabby Style Wooden Family Cream Photo Frame. Perfect for those extra special cherished photographs of loved ones. Fitted with two Brackets for easy wall mounting. 9 x Rectangular Thumbnail Photo Insert Windows – Aperture Size: 37mm x 22mm approx’. Photo Frame Size: W=24cm (9.5″) x D=15mm (0.5″) x H=29cm (11.5″) approx’ For more info’ please follow this eBay link. Thank you. 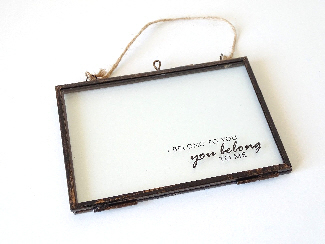 Shabby chic style elegant stylish glass photo frame Beautiful Glass & Metal Photo Frame with Hinged Door & Sliding Clasp. Display photo’s on two sides of the frame. Perfect to display those extra special cherished photographs of loved ones. For more info’ please follow this eBay link. Thank you. Metal cockerel ornament decoration on a spring. Painted white. Fun Decoration for your kitchen. For more info’ please follow this eBay link. Thank you. Set of 4 vintage style medicine shape glass bottles with wooden container. This sweet mix of modern and vintage glass bottle holders is a neat novelty item to add decoration to the home Ideal for decoration or to possibly hold bath oils, bath salts/crystals or even lotions or coloured water to compliment your colour scheme decoration etc Fore more info’ please follow this eBay link. Thank you. 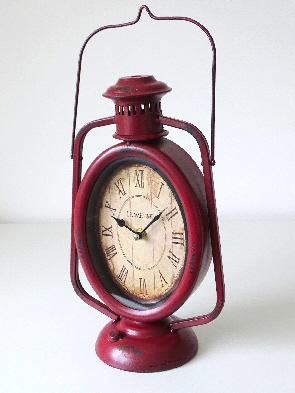 Vintage distressed retro style metal red oil lantern mantel clock For more info’ please follow this eBay link. Thank you. 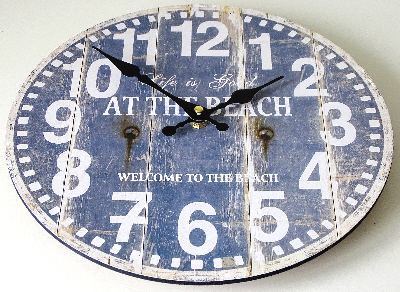 Life is ‘Good at the Beach’ blue & white wooden rustic distressed shabby chic wall clock with ornamental hands. Wooden Beach Wall Clock. White Arabic Numerals. Gold Ornamental Hands. Ideal for Kitchen, Office or Bedroom. Clock Diameter = 30cm approx’. Clock Depth: 3.5cm approx’. Quartz Movement/Mechanism 1 x AA Battery Required (Not Included). For more info’ please follow this eBay link. Thank you. Wooden Sandy Toes and Salty Kisses beach sign and metal wall hook This fabulous blue and white sign reads ‘Sandy Toes and Salty Kisses’ and is just perfect for adding a sweet touch of sandy beach charm to any room in the home. 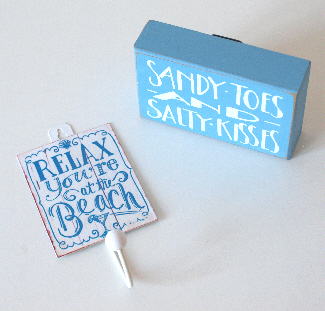 The gorgeous blue and white sign hook reads ‘Relax You’re at the Beach’. 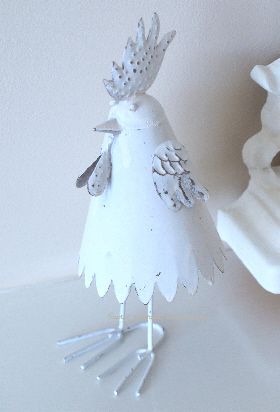 Perfect for adding a touch of seaside charm the bathroom or hallway. For more info’ please follow this eBay link. Thank you. 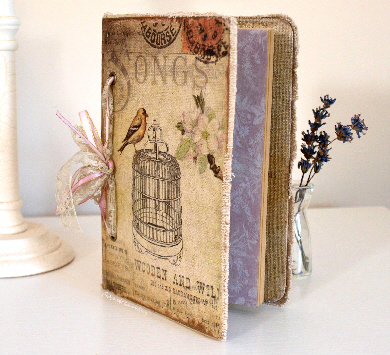 Shabby chic vintage distressed effect style handmade note book scrapbook for photographs & memories & keepsakes Perfect for photographic keepsakes, letters, notes, magazine & newspaper cuttings & memorabilia or drawings or as a journal etc. Please Note: This item is supplied gift wrapped in plain buff paper and tied with jute cord & with a label for you to write. Ideal gift for someone very special. For more info’ please follow this eBay link. Thank you. 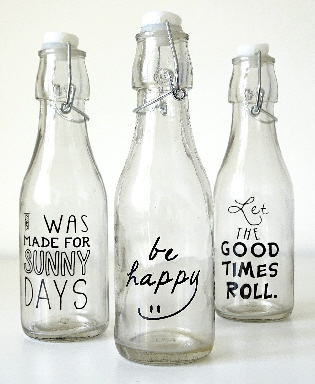 Fun set of three clear glass bottles with slogans. 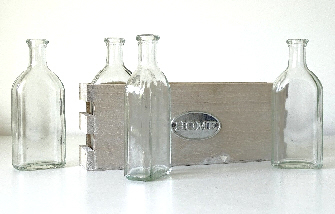 This mix of fab glass bottles with stoppers are a simple way to decorate party drinks! The fun quotes will be appreciated by family and friends to make any drink look that ‘little bit different’ and delicious! For more info’ please follow this eBay link. Thank you.